NETWORK FINALS: GREY’S ANATOMY gained 0.1 in final numbers, while SCANDAL, THE FOUR and GREAT NEWS lost the same. CABLE HIGHLIGHTS: TNT’s NBA doubleheader had 2 of the night’s top 3 ratings at 0.64/0.46. Paramount’s LIP SYNC BATTLE returned to its former Spike home at 0.47. 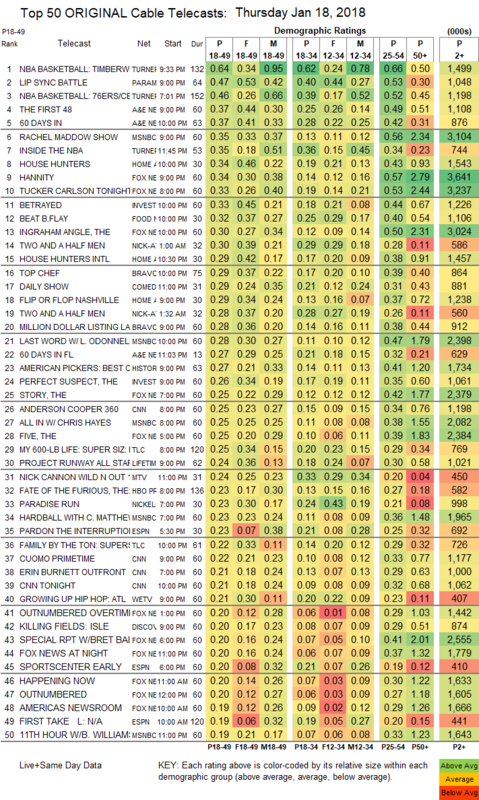 On A&E, THE FIRST 48 was steady at 0.37, and 60 DAYS IN was down 0.06 to 0.37. It was one of the closer recent calls for cable news, with MSNBC’s RACHEL MADDOW SHOW at 0.35/0.56/3.1M, Fox News’s HANNITY at 0.34/0.57/3.6M, and CNN’s ANDERSON COOPER 360 at 0.25/0.34/1.2M. On HGTV, HOUSE HUNTERS gained 0.03 to 0.34, HOUSE HUNTERS INTL was down 0.04 to 0.29, and FLIP OR FLOP was also down 0.04 to 0.29. On ID, BETRAYED ticked up to 0.33, and THE PERFECT SUSPECT was down 0.04 to 0.26. Food Network’s BEAT BOBBY FLAY lost 0.03 to 0.32. On Bravo, TOP CHEF slipped 0.02 to 0.29, and MILLION DOLLAR LISTING was up 0.03 to 0.28. On Lifetime, PROJECT RUNWAY ALL STARS ticked up to 0.24, and MAKING A MODEL was down 0.03 to 0.08. MTV’s WILD N OUT gained 0.03 to 0.24. We’s GROWING UP HIP-HOP fell 0.07 to 0.21. Discovery’s KILLING FIELDS ticked down to 0.20. Tru’s THE CARBONARO EFFECT dropped 0.07 to 0.16. Syfy’s SUPERSTITION lost 0.02 to 0.12. The season finale of USA’s DAMNATION held at 0.12. On CMT, NASHVILLE was down 0.02 to 0.11 (we won’t have the TV Land rating until Monday). Freeform’s low-rated BEYOND remained low-rated in its return at 0.10. 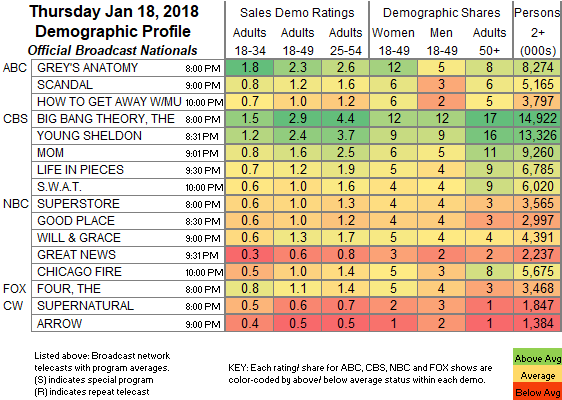 POP’s IMPACT WRESTLING ticked up to 0.07.